Every single solitary species of bird is special and unique in its own way and I am excited to begin highlighting some of my favorites. 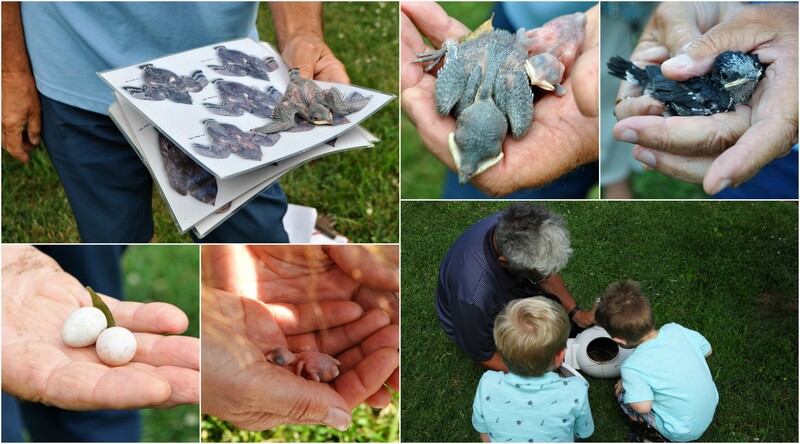 The reason I’m starting with purple martins is because this is their season. They only live here during the warmer months and overwinter in Brazil. Can you imagine such a small creature flying such a long distance? That in itself is pretty spectacular. What’s even more interesting is that martins living in our area almost entirely depend on humans for nest sites as invasive species such as starlings and swallows completely take over natural cavities that they need to nest. 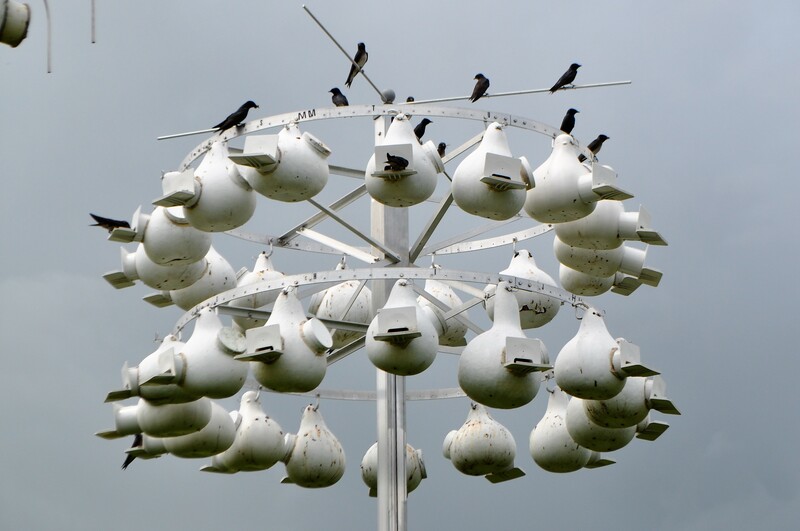 If you ever see large white houses or a grouping of small gourd shaped bird houses on a tall pole in someone’s yard, you are looking at a purple nest site. Another fun fact is that they are the largest of all the swallows in North America. At Bombay Hook National Wildlife Refuge, data is collected multiple times per week to track colony size and health. Each of the gourd groupings can be lowered and the nests can be opened so the counts can be done quickly. 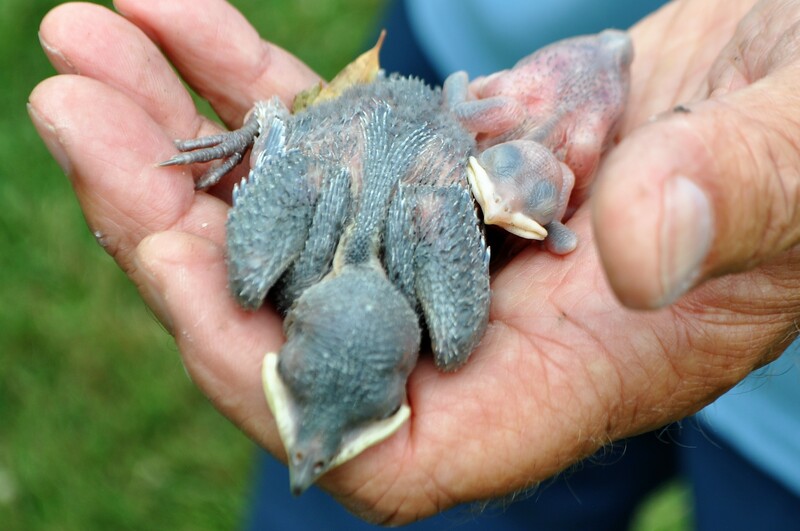 During the nest checks, the babies can be handled for short periods of time. It’s an old wives tale that birds won’t care for their young if you touch them as birds don’t have a sense of smell. Dead nestlings, unhatched eggs and invasive species are removed while the nests are open so as to enhance the overall health of the colony. Bombay Hook has opened the nest checks to the public and they are an amazing, hands on learning opportunity for children and adults alike. Many of the checks are posted on their Facebook page, but most are not. You can call the office for dates and times if you are interested in attending Mondays, Wednesdays or Fridays during the Summer. Even if you aren’t able to attend these weekday nest checks, you can still visit and observe the birds bringing food to their babies all day long. Both parents feed the young, with the males being all black and the females having a light colored breast. Binoculars will give you an even closer view. A very rare occurrence, two babies of different ages in the same nest! You can have your own nest site if you’ve got an open area. If you don’t, do you know of a school, church or business that does have the perfect location? These birds need our help to survive and our kids need to learn to appreciate how each creature fits in to Mother Nature’s perfect plan. Martins primarily eat insects, so they are the best, all natural pest control option for your backyard that will end up being less expensive than paying for pricey mosquito control treatments. It’s a win, win, win situation!